Check out the OFFICIAL SSN-725 Web-Pages. USS HELENA (SSN-725) is named for the capitol city of Montana, founded as a gold and silver mining town in the late 1860's. She is the fourth United States Ship to bear the name HELENA and the 38th of the 67 submarines built in the Los Angeles Class. The first was a "gunboat" (FG-9) that served during the Spanish American War and then in the Far East, primarily around China and the Philippines. The second was a light cruiser, (CL-50), which served with distinction in the Pacific during World War II, playing a decisive role in the Battle for Guadalcanal, eventually being sunk by three torpedoes. It was the first ship to receive the Navy Unit Commendation. The third was a cruiser, (CA-75), which served with distinction during the Korean Confict, eventually becoming the flagship of the Seventh Fleet and later the First Fleet. It was the first naval unit to receive the Korean Presidential Unit Citation as a result of its gunfire support effectiveness. The information presented on these pages is UNCLASSIFIED and obtained from various sources in the Public Domain. All opinions expressed here are strictly my own and do not neccesarily reflect the official position of the Department of the Navy. Want to join the Silent Service Ring? This NavRing site is owned by Scott Fredrickson. Want to join the NavRing? 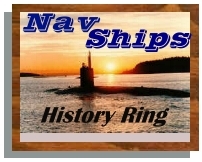 This NavShips History-Ring site owned by Skot Fred. Want to join our RING?